Product prices and availability are accurate as of 2019-04-24 08:07:07 UTC and are subject to change. Any price and availability information displayed on http://www.amazon.com/ at the time of purchase will apply to the purchase of this product. 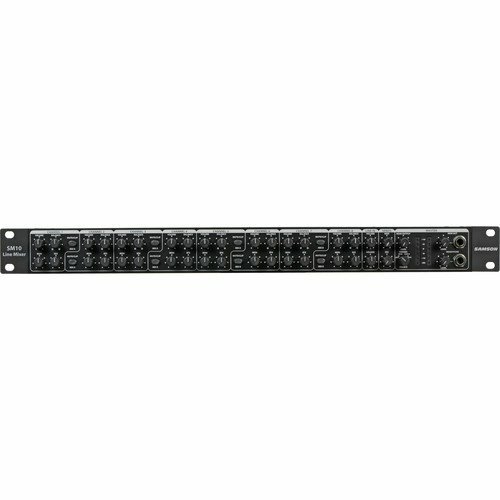 AudioDJ.com are delighted to stock the fantastic Samson SM10 Rackmount Stereo Line Mixer. With so many available today, it is wise to have a make you can trust. The Samson SM10 Rackmount Stereo Line Mixer is certainly that and will be a perfect purchase. For this reduced price, the Samson SM10 Rackmount Stereo Line Mixer comes highly respected and is a popular choice amongst most people. Samson have added some great touches and this results in good value. The Samson SM10 line mixer is a versatile and reliable addition to your audio setup! This generously packed Samson SM10 stereo mixer is perfect on stage, in studios, boardrooms, health clubs, restaurants, houses of worship, and more. The SM10 line mixer features a 19 inch rackmount metal chassis unit is internally powered and can be easily integrated into any existing system to more efficiently group your signals. For either audio or video applications, the Samson SM10 rackmount stereo line mixer brings various signals together for a truly amazing audio experience! Inputs The Samson SM10 provides ten channels with 1/4-inch stereo line inputs and a balance control for each channel, two channels include XLR mic inputs. This allows you to blend the relative levels of stereo inputs to your liking. In addition, each channel includes a switch for +4 dBu or -10 dBV line level input. Outputs The Samson SM10 line mixer provides electronically balanced main stereo XLR and 1/4-inch line outputs. The SM10 provides versatile signal routing via Main Mix, Mix B, Monitor and EFX bus outputs, as well as low noise and discrete microphone pre-amplifiers with 48-volt phantom power. Two auxiliary sends can also be used to route signals to external effects, or create a separate mix for on-stage monitors. The SM10 features front panel headphone and monitor outputs with dedicated level controls. The mix may be audited with the SM10's 6-segment LED meter and a flexible meter/headphone source control.